I tried my best not to do too much research online, or to see too many pictures of the places in Morocco we were about to experience. I wanted it to hit me smack dab in the face when I was there, on the ground, walking the streets and breathing the air. If you haven't been, and you don't want any spoilers, don't read this report! The itinerary we made involved driving between Tangier, Chefchaouen and Fez, so we were looking forward to those rides, as in the past the best scenery became available in the middle of nowhere in the past. In preparation, I packed my hi res digital camera, and my trusty 35mm lens, my pocket camera for video, my phone and a pad of watercolor, some back and blue ink. I prepared a playlist which was mostly Dead Can Dance mixed in with some saharan ambient music - a MIX which proved perfect backdrop to this adventure. Our journey took us from San Francisco to Frankfurt, Germany where we had to hop on a charter bus to a smaller airport in Hahn so that we would not arrive too late in Tangier. The ride between the airports took us through Rhineland, through the little riverside town of Main, along the hilly landscape of rural Germany, with tiny towns peeking in the distance. The rolling green hills reminded me of the Berkshires with their lush simplicity. At the gate waiting for our Tangier flight, the look of the folks assured us we are heading into a different world. We arrived Tangier exhausted but ready for a fantastic adventure. The airport was small, empty and clean. At the baggage claim we were greeted by curious orange cat, who was just hanging out, watching the luggage spin on the belt, - A CAT AT THE BAGGAGE CLAIM! This was a good sign. We laughed, changed some money, and headed out to meet out driver. SALAM! I said with a smile to the driver as he loaded our bags. It was one of the few words I knew in Arabic, but one I believed in and couldn't wait to use. What better greeting than PEACE?? I thought. Peace be upon you, I recited in my head, as we rolled in on the outskirts of town, looking out the window with amazement. The evening was overcast, with a sandy grey palette. 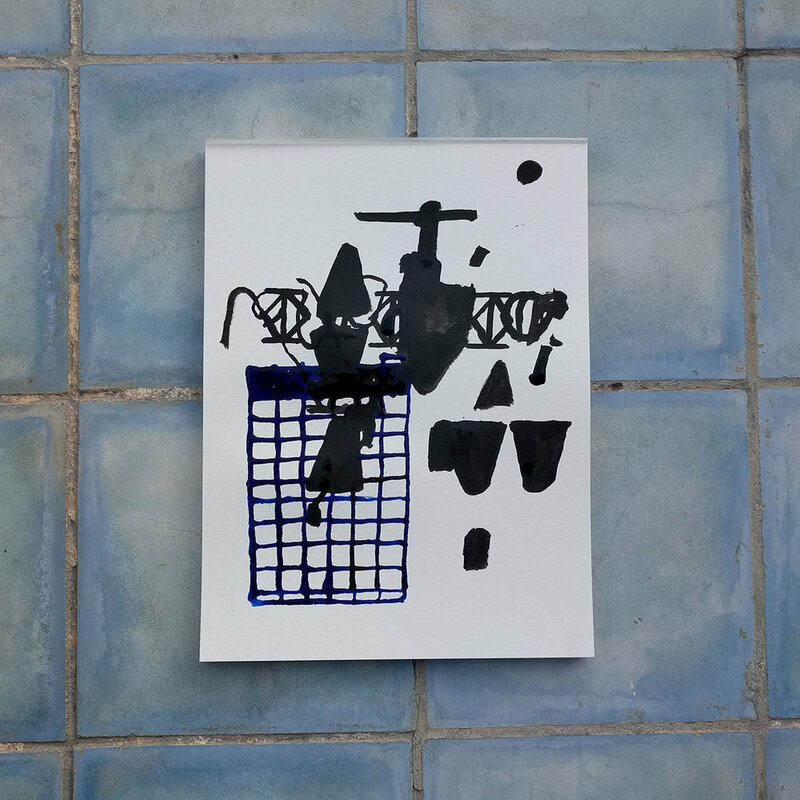 We could see sheep, cows, dogs, cats in the fields we passed, as we saw more buildings, we drove past shops, young men in the street, old men crouching down against crumbling and painted over walls smoking from long wooden pipes. 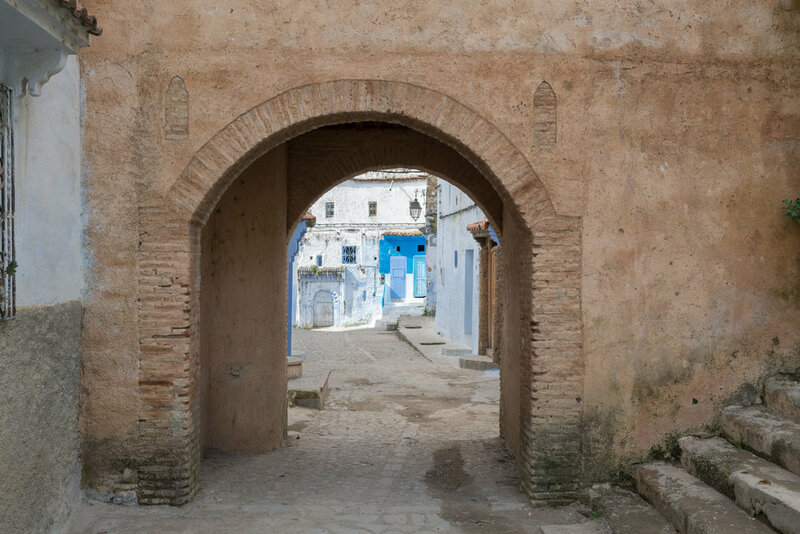 As we got closer to the riad and the medina, the streets got narrower and narrower, and then we reached the medina gate, the “BAB” a giant medieval fort looking structure, and when we got inside, we parked and followed the driver through a literal maze of alleys. 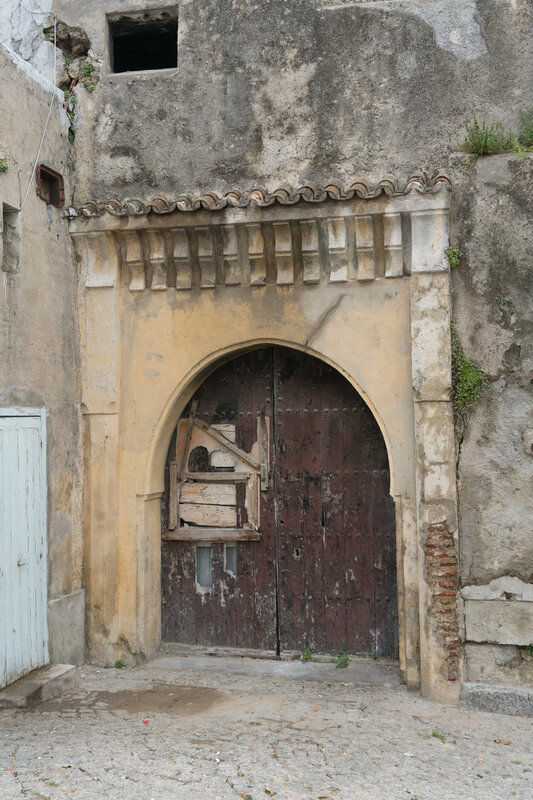 We arrived at our riad, which was once a medieval Casbah - A citadel within a walled city - a Fort within a fort. The interior decoration smacked me right in the mind's eye. There was a powder blunderbuss on the office table, at least a few hundred years old. Framed pictures of tribal folk, a patchwork of beautiful carpets, middle eastern motifs - the place was amazing. Our room in the casbah was a beautiful green, with vibrant carpets, old books in French and Arabic, strange artifacts hanging on the walls. The bedroom entrance was shaped like a bab siluette - like the top of a mosque shape. We had a drink and checked out the roof. 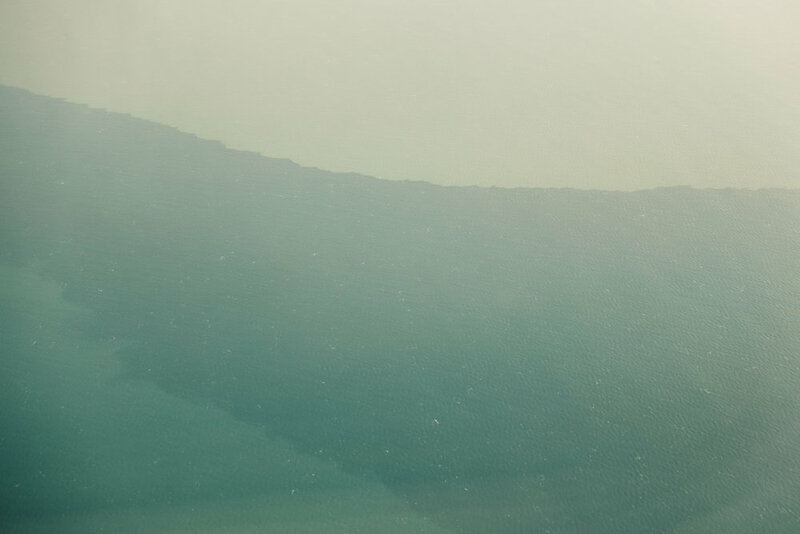 An amazing panorama opened up before us. 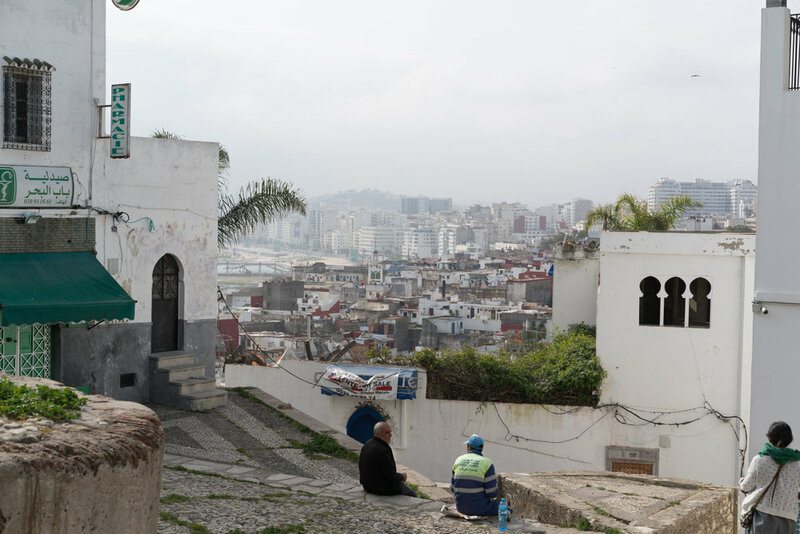 A three dimensional maze of structures as far as the eyes could see, and a vast beach in the distance, city lights, the sound of the city, and then the call to prayers started to reverberate across Tangier. Right then and there was the momentary bliss of discovery - a new place and a different time, we pulled ourselves out of our grid somehow, and placed each other on this rooftop for that exact moment - forever. 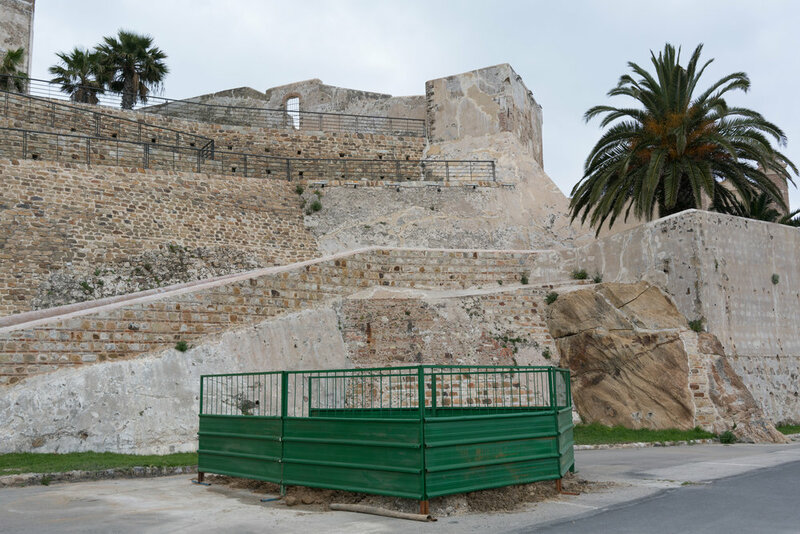 The next morning we set out for the great labyrinth - the Tangier medina. A maze of alleyways painted in a patchwork of bright colors and off white, quiet pathways where you are not sure if you are on a public path or about to walk into someone's home. Everywhere we looked - we wanted to photograph. 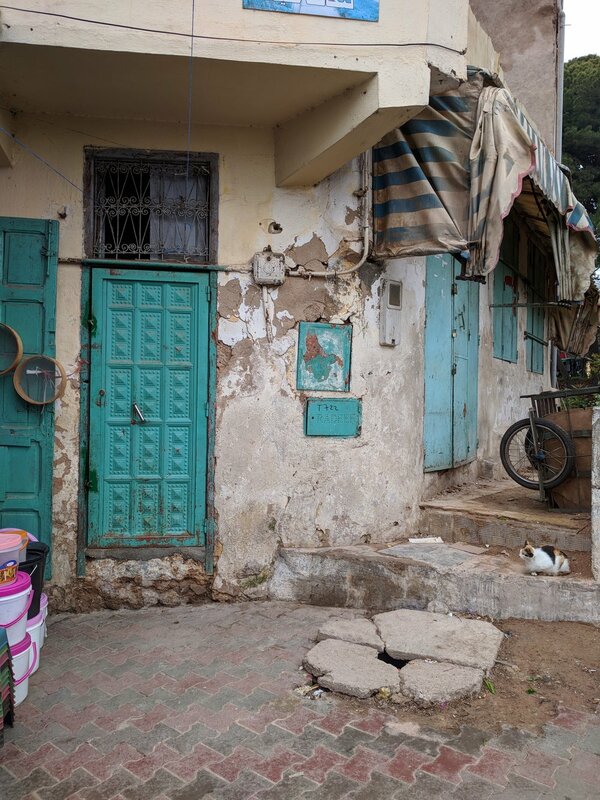 The many layers of faded paint on ancient walls, old arabic handwriting fading under a climbing vine or palm leaves. 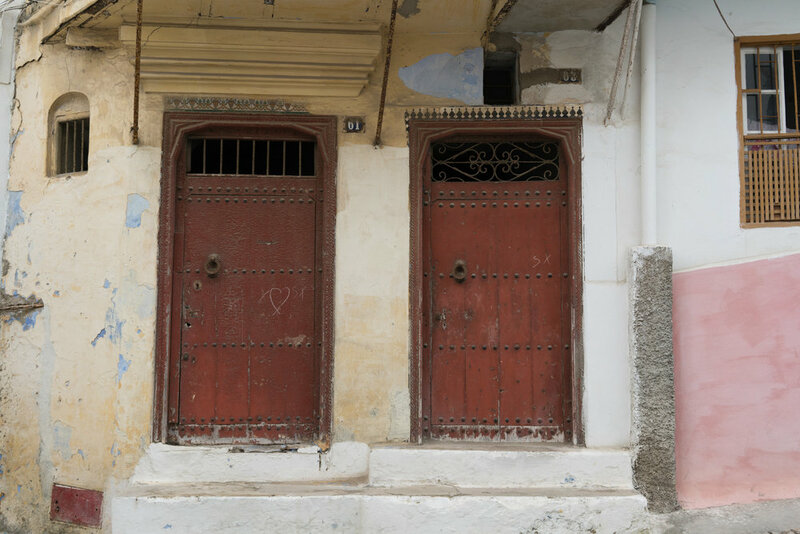 An endless collection of beautiful doors - so mysterious of their history - what is on the other side, I wondered. Each composition inside the viewfinder was like a masterpiece. You can't make this stuff up. I just had to compose, shoot and walk to the next photograph. The sheer volume of surface area demanded that I make my photography decisions on the spot - there is not much time to think about it. I love getting in this zone - when you can imagine the photograph already - and all you have to do is line up the viewfinder, make sure the settings are right, and just shoot. As a painter, I take photographs for reference, and to document what I catch. The photographs by themselves are a byproduct of my creative research. On their own they are a collection of photos, and in a broader sense, they are a piece of my creative process. They catch what I fail to see at the moment, capture the colors and shapes that I hunt, and stock my palette with. The hunt was bountiful. The ancient layers of real life - the geometry - a symphony of rectangles, bright shapes popping out of dusty walls, everything was beautiful and mysterious. Which authors and artists of the 1920’s put their shoes on these cobblestones? What door did Matisse paint? What cafe did Kerouac and Burroughs frequent? The poems were just floating in the air - mixed with Moroccan chants and music - and old men with cloaks walking the streets in no hurry at all. The women in bright, colorful patterns against even more color and pattern of the street. The kids, mostly boys, running around, playing football in the street, learning to hustle. The young men were hustling hard, eager to make a few bucks on directions, asking where we were from, where we were going and whether we wanted anything. “Welcome to Morocco” is what they all said, honestly and with pride. Peace, I would say back. 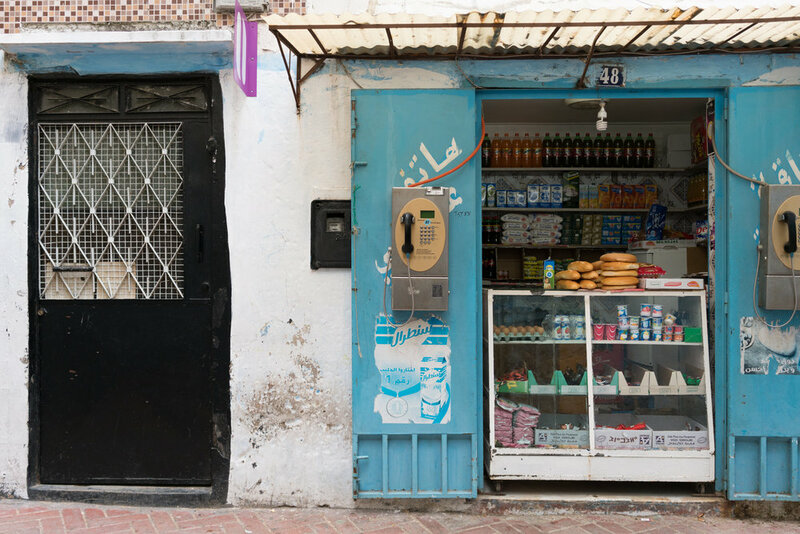 We spent 2 days exploring mostly the Medina of Tangier. To our surprise, it was mostly devoid of tourists. We walked the maze, ate at Cafes, walked the markets, shopped the shopping streets, checked out the local flea market where I bought a mystery cassette for 10 cents. 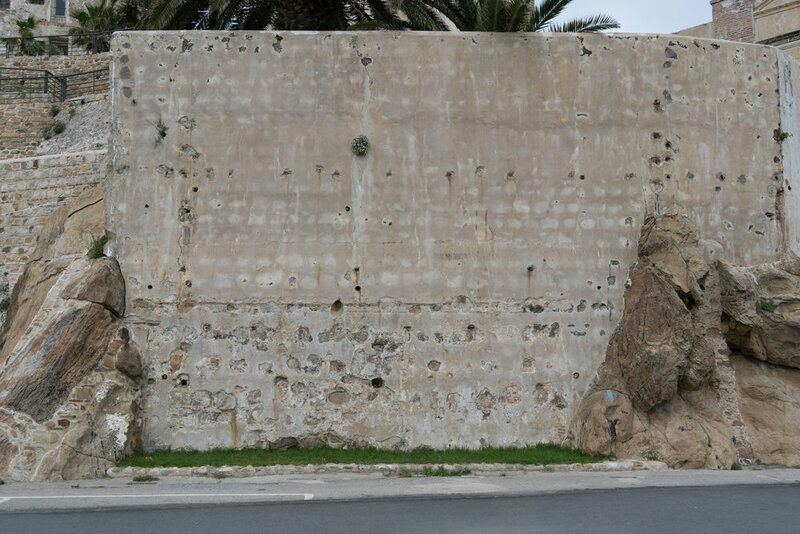 We walked along the waterfront and took photos of the ancient sandstone walls, a place which fascinated me because you could see the evidence of time build into the wall. 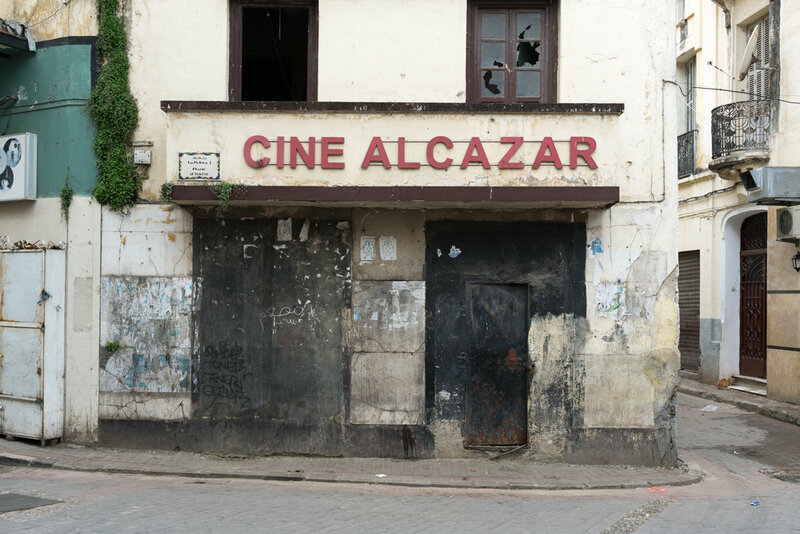 There were blocked doorways, cave like nooks, blocked up windows, relics of the old media wall merging with modern concrete. The constructivist spirit was again awakened by the patchwork of the port wall. Each block of sandstone, each cobblestone, was real and authentic and was there for a long long time, seen by traders, artists, lots of folks over hundreds of years. I took too many photographs, but still not enough, as if I am trying to scan the entire surface area and then digitally reconstruct it so I can study it in high detail. Lark, my partner is also a photographer. Her work evokes a cozy feeling of well being. 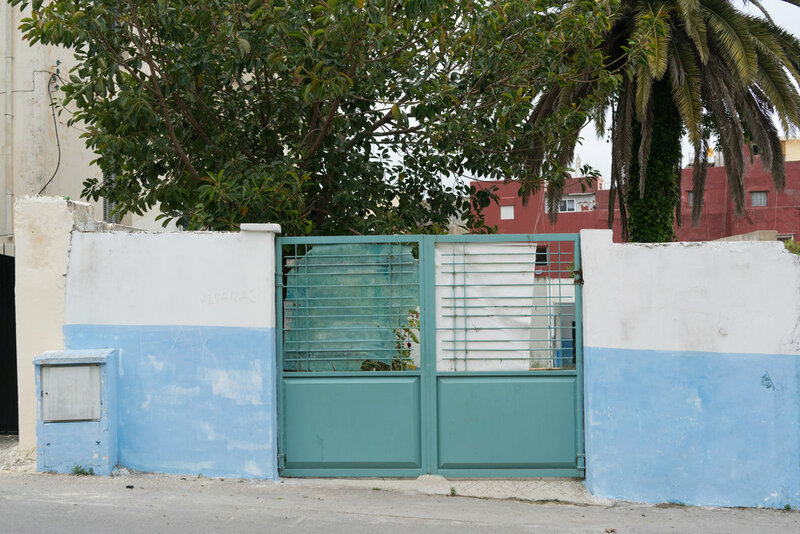 Her photographs capture the most modest pieces of her surroundings - because she has a great eye for color, pattern, composition and mood. At some points our work overlaps, where we both love to shoot colorful street still life - where hers’ is more soft and inviting, mine is more formal, strange and avant-garde. So there we were, two walking photographers, like kids in a candy store, wandering round ancient town, taking it all in, and capturing as much as we can. Sometimes we find ourselves at such a beautiful place, that we just have to put our cameras away and just soak it in. Sometimes we go on second walks without cameras - for that reason. The drive to Chefchaouen reminded me a little of the foothills of the Sierras in the winter. This was North Africa - windy mountain road, lush green hills, rugged terrain, olive trees blurring by, a mule on the side of the road, folks wearing funny straw hats with colorful bon bons. A young man enjoying a smoke from a long pipe overlooking a valley. Modest country homes with green gardens, cacti, goats eating lunch. 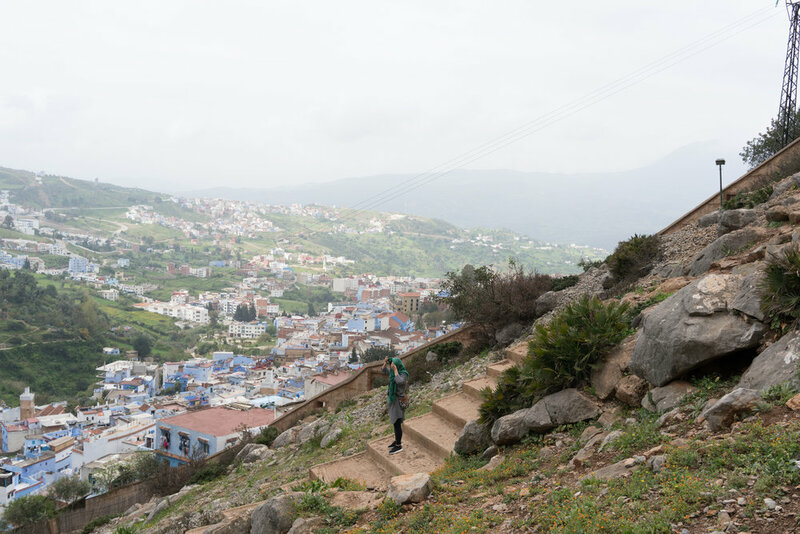 As we climbed into the Rif, we saw the city up above - a blue gem nestled in the rugged surroundings. The overcast sky gave way to serene sunshine, and as we drove into the heart of the city and towards the medina, the sun sliced through the dusty streets and every one was enjoying the day. 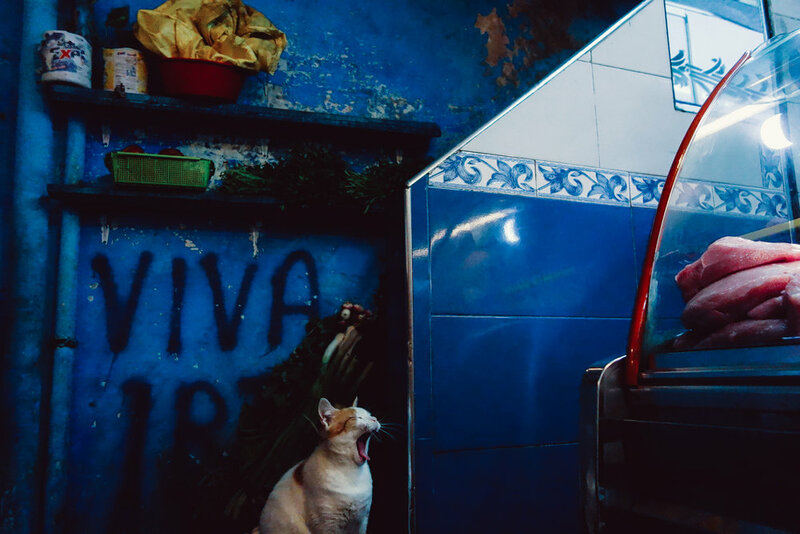 We got dropped off at the entrance to the Medina, and entered the blue labyrinth, pulling out luggage up cobblestone streets, and smirking at the sight of Chinese girls posing for selfies in front of blue stairways. We found our place and raced to the roof patio to check out the view - and froze in place, mesmerized instantly by the view and sounds. So peaceful and beautiful, I just wanted to stay there staring out forever, to long long and hard enough to burn this memory into my cortex so I can come back to this peaceful place at will, wherever I will be. 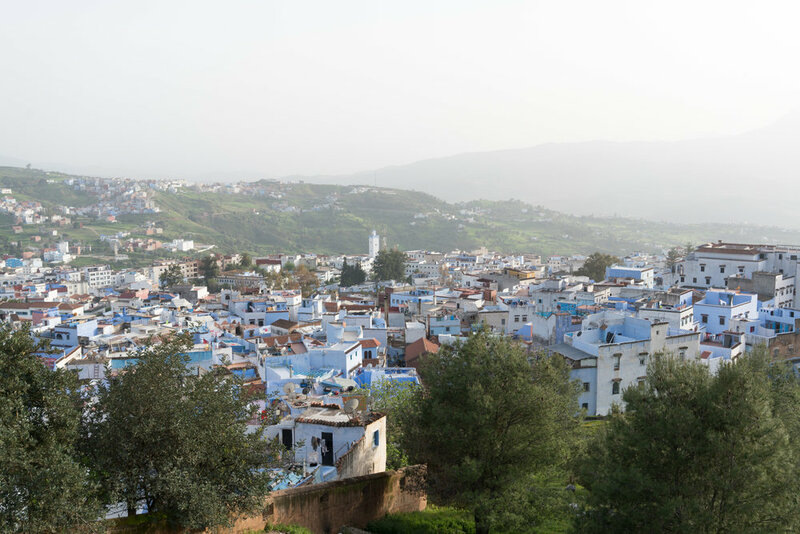 Chefchaouen - Bab el Souk. We climbed the blue labyrinth town until dusk. The narrowness of the alleyways made the walls intimate. There was a closeness, a proximity to people's front doors, you could smell dinner and hear children and prayer radios. Often, I would peek inside a shop or store and see a working loom, weaving a textile. The maze began to make sense after the third or so pass on the same street. Things were starting to get familiar to the point of us knowing which way to go - where we haven't been before, but that took awhile. We walked the shopping streets where the sellers could spot a tourists interest with a single glance, then proceed to offer and tout their wares. Young men could instantly detect any hesitation of movement - and ask you if you knew where you were going, and if you wanted to buy something. We wanted to buy some rugs for the house. The hunt for a rug in Morocco is not for the faint hearted, or the haggle challenged. If you stop and show any interest at all, you will be asked to proceed into the showroom, most often a courtyard in a medieval courtyard that is absolutely overflowing with colorful rugs - hand woven kilim, machine woven cotton, hand embroidered camel wool etc. The shopkeeper we got caught by, was rather insistent on Selling us a 250 Euro Kilim, a beautiful one but way out of our Moroccan rug budget. It took about 20 minutes and some emotions to get out of that rug shop! And into another one, where Lark played the delicate game of haggling like a champ. I on the other hand am a terrible haggler - I would rather pay full price for the premium of not haggling. Every purchase takes about 10 -15 minutes to work out it’s quite exhausting. The next day we hiked to the old Portuguese mosque thats on a hill overlooking the town. We crouched near a huge boulder to take in the giant mountain side. The sheer scale of it is amazing and daunting. A man with a mule walked by, some dogs from a neighboring farm started barking at us from afar. We turned back towards town and went up along the top edge of the fort wall. A man was working on the loom inside the guard tower, a sheep with floppy ears munching on grass, the afternoon prayer call echoed through the blue labyrinth. I wanted to stay in this town for much, much longer. There were so many more places to explore: the nearby national park, the countryside, the local markets, but it was time to pack up, take in the last rays of the setting sun over the blue city, and head through the Rif down to Fes. The road to Fes was so beautiful. Lush green hills, seeing the relaxed countryside made me want to drive it on my own. Somewhere between Chefchaouen and Fes. It was raining when we arrived at the ancient gates of the Fes Medina. It was raining when we arrived at the ancient gates of the Fes Medina. 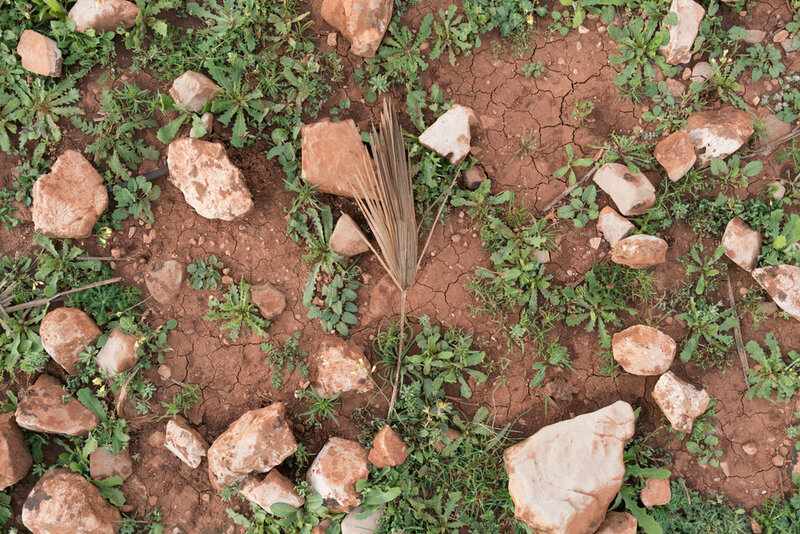 We were met by a baggage carrier from the Riad, whom we followed through the crumbling sandstone maze, but this time it was an ochre labyrinth. When we arrived we discovered that the Riad was also an ancient citadel - the Kasbah within the ancient walled city. And there was an amazing vegetarian friendly restaurant right at the the hotel. The food was amazing here - the staple was broad bean soup, called Bissara, with traditional Moroccan brad disks, called Khobz. Vegetarian tagine, and all sorts of bean and rice dishes. We even tried Moroccan wine which was great - very tart and dry. Our room at the Riad was palatial, on the top floor, medieval door locks, ancient wood cabinets, 20 foot ceilings and very long linen drapes covering the huge windows. It looked like Cleopatra's chamber. 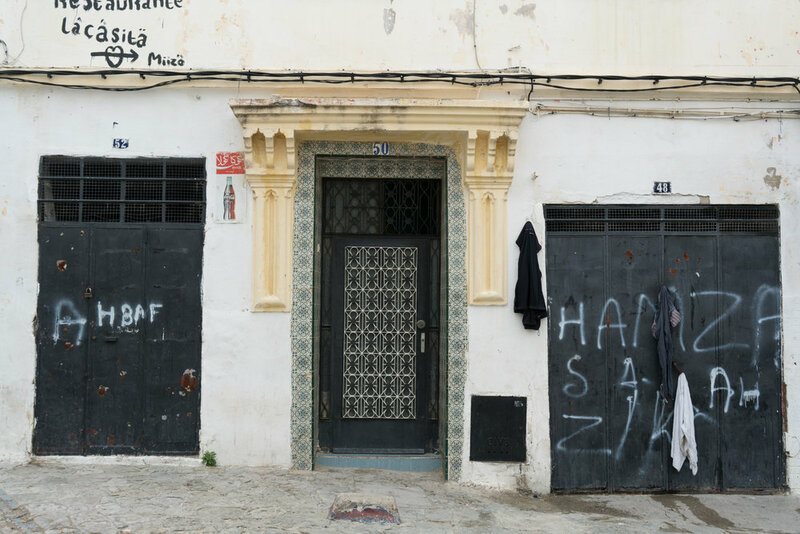 Fes is grittier than Tangier, and almost a constant hue of yellow ochre. Gates of Astapor? No! This is Fes. Its very easy to get lost in the labyrinth. I wished I could have left breadcrumbs or used a neon string to find our way back, of course, we wandered up and down, getting lost, finding our way again, and getting lost once more. We had to take breaks and found a rooftop place that served beer. 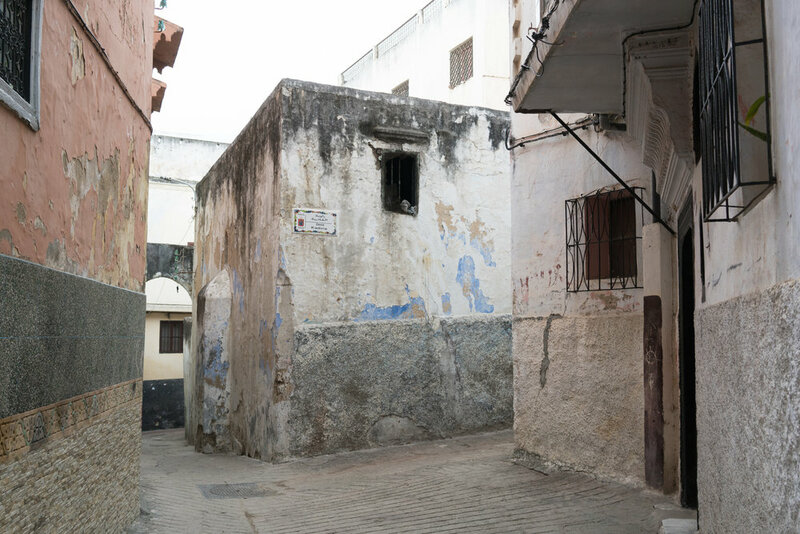 It was harder to take photographs in the Medina, because space seemed narrower. 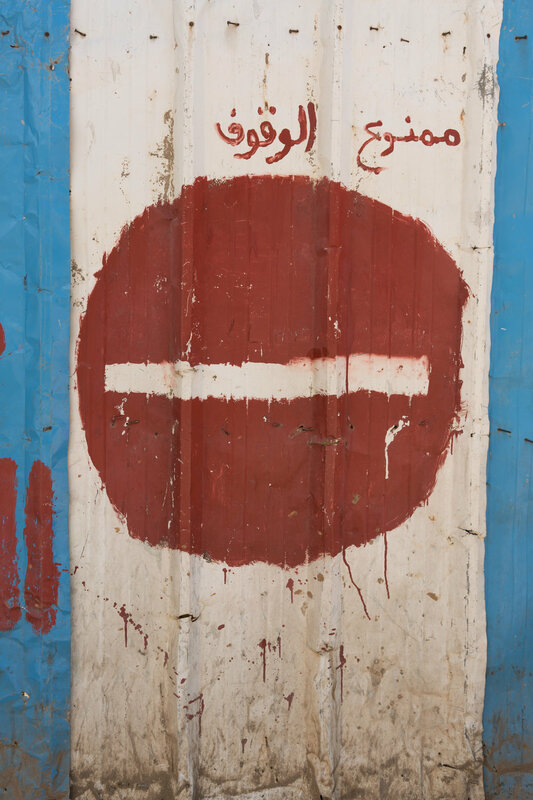 The walls were marked up with scrawled arabic, nail holes and patched up areas that looked like my ideal painting. The markets were intense. Lots of people, much more tourists, crowded in tiny alleyways, donkeys, motorcycles trying to weave through. After a few hours at a time, we needed to get back to the citadel and relax with some bean soup. After two days of wandering the maze and walking 8 miles a day, we were excited to get out of town - the next and final stop was Bhalil - a little hillside town founded in the 4th century, about an hour south of Fes. Another gem from a cassette shop in the Fes medina. The green hills opened up and we were in the countryside, fresh and open and green. Our host had mentioned that the past winter had brought lots of rain, and so all the farmers were happy. The olive groves looked like they went on forever. 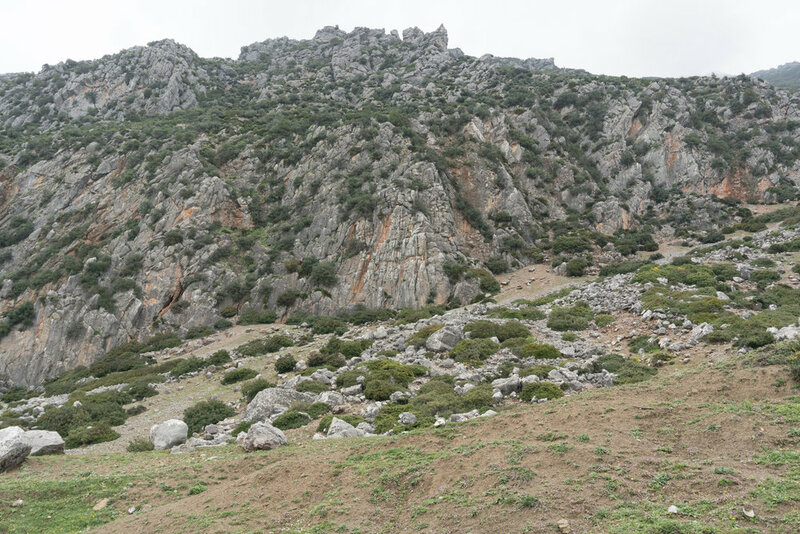 As we climbed the foothills and drove into Bhalil, we realized how far out this place was. We dropped our bags and set out for the hillside as the sun was setting - we wanted to get in a good walk before night fall. Walking through town it seemed we were the only foreigners there. All the local folks were staring at us as we wandered along the dry canal and towards the hill. The road turned into red mud a rocks, and we climbed along a ditch up the the flat hill top. As we crested the hill, the most wonderful, fantastic landscape emerged - a distant valley, distant buttes and mountains, and the setting sun illuminating the pink clouds - the most beautiful gradient. A flock of sheep surried by, a local woman leading a donkey with another flock of sheep was walking in the distance. The sound of pebbles under my feet, roosters and sheep in the distance. We stood and watched at dusk set in and the town below, sparkling called us back to eat and rest. The next morning was very very foggy. Visibility was about 50 feet. 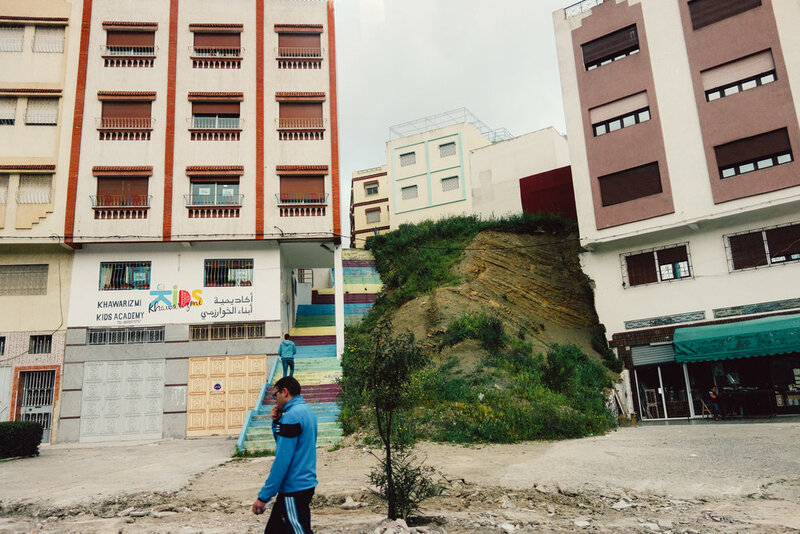 We took a taxi to Sefrou, a nearby city with its own medina, which we walked for a few hours. Took photos of dilapidated walls, alleyways. This was out last day, so I was happy I had saved the injuries and sickness for last. 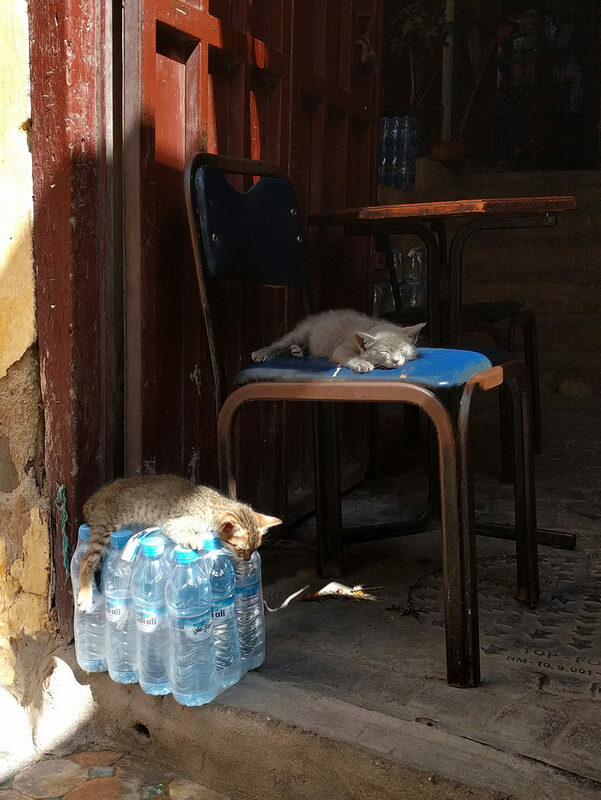 We got back to Bhalil and found ourselves starving, with no food nearby, a tiny town with no restaurants - only local cafes that serve coffee and cigarettes. As we walked out in search for food, we met an Italian couple who was also in the same predicament - they were driving through town and though our Riad was a restaurant. The innkeeper told us of one place that might have food, so we hopped into their shiny red mini cooper and drove up to the center of town in the thickest fog. We couldn't find the place, their French allowed them to ask a locals and after a few u turns, we parked and found the place. It turned out to be a barbeque place with kebabs cooking out front and we were 3 vegetarians and 1 meat eater. Thankfully someone told us there was a soup place across the street. This was a hole in the wall, and they offered 3 soups, that's all they had. We all opted for the bean soup and a bunch of bread disks. We exchanged stories about where we are from, and parted ways after Lark offered to cover lunch. It was around 3 euros. We headed back to our place and spend the rest of the day resting, and packing for the journey home. I went up to the rooftop, and soaked in the last of the wonder - this ancient place, basically untouched by tourists, was alive below me. Having that hard to find lunch, in the middle of nowhere, in the fog, in Morocco with 2 lovely strangers, was a perfect closing to this fantastic adventure. 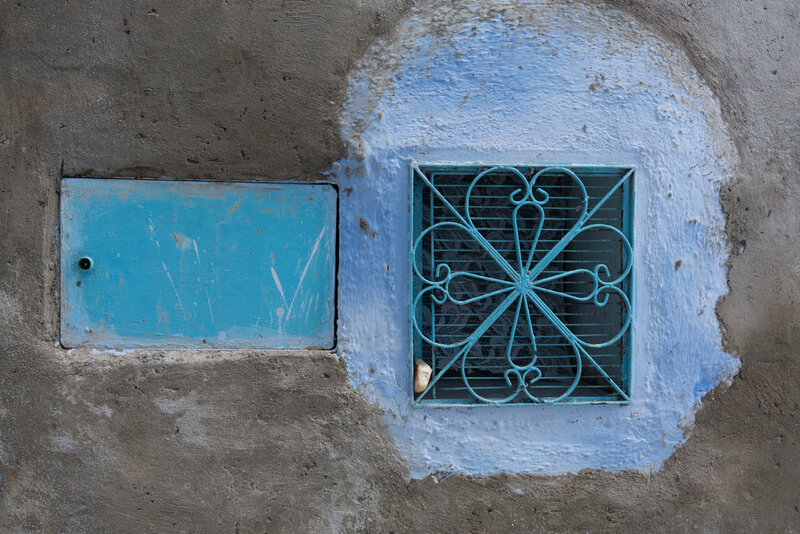 We left Morocco satisfied with our adventure and filled with wonder and inspiration. As we gained altitude above the neat olive fields, I realized that I needed to come back to this place again. Such a strange, peaceful, laid back, friendly place, so beautiful yet still such a mystery to me. So many things to be discovered and learned about this part of the world. Check out the behind the scenes documentary! all content © philip ilatovsky 2018, All rights reserved.